A couple of months ago, I was contacted by an associate editor at Psychologies magazine, the UK’s biggest and best-selling mindful living publication. They wanted to feature me in their Blogger Spotlight, on a page capturing Feasts of the Middle East. 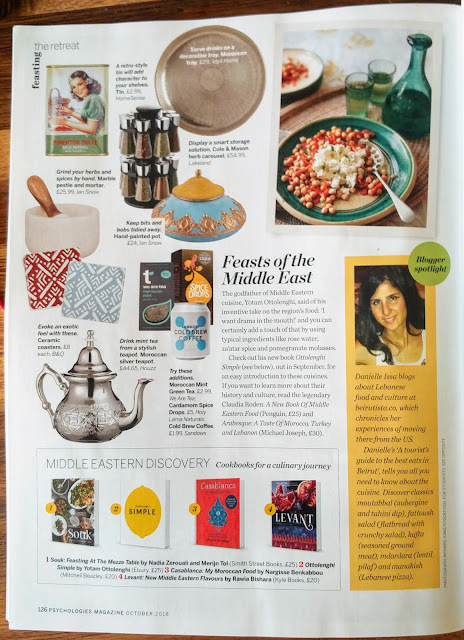 The October 2018 was just released, and for those of you who manage to get your hands on it, find me on page 126, alongside cool kitchen tools and various cookbooks detailing our region’s cuisine. It’s a rare honor to see my name adjacent to that of chef, restaurateur, and food writer Yotam Ottolenghi, whose book Simple was recently launched. To be singled out among the rich roster of food and culture bloggers in this neck of the woods instills immense pride, so I am thankful for the reach you as readers help foster when you share my articles or interact with my posts. Along that train of thought, I felt inclined to check the blog’s page views by country, which since inception has attained nearly 1,100,000 hits! The majority of readers are based in the US, which marks 54% percent by proportion; Lebanon comes in second, at 25%; and the balance is spread among UK, Russia, France, China, Germany and Ukraine. “Oh, the places you will go,” beamed Dr. Seuss. Indeed, I would never have imagined this sort of visibility for my blog six years ago when, in a frenzied fit to chronicle my adventures and fulfill my longing to write, I established Beirutista.co. In other press news, I'll soon be appearing on Alfa OSN’s “Sharaftouna,” this summer’s revamped edition of “Ouyoun Beirut.” Date and time to be confirmed. Let's pray the show hosts cut me some slack, as undoubtedly, I’ll be muddling Arabic with English and a dash of French! What’s a third culture kid to do?